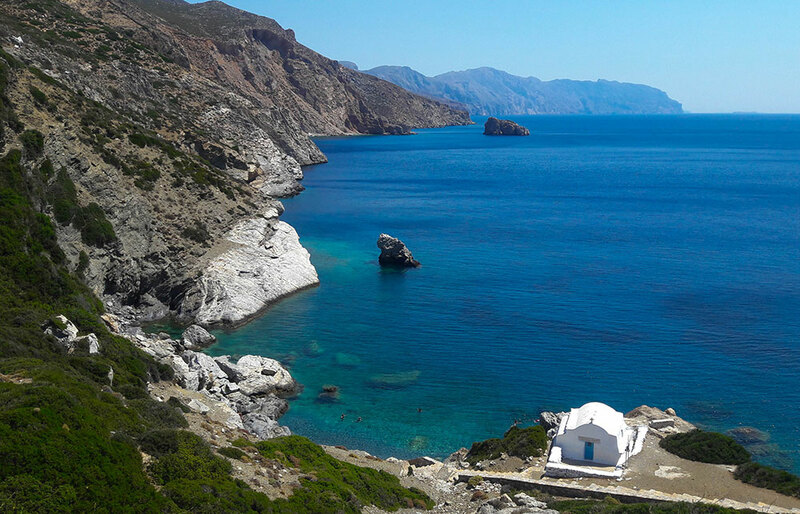 The easternmost island of the Cyclades, Amorgos is loved for its untamed beauty. 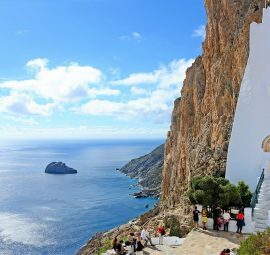 Its virgin landscape inspired the filmmaker Luc Besson to shoot scenes of the movie “The Big Blue” in the island, and made Amorgos famous worldwide. Being an island of strong contrasts, firstly it amazes its visitors with its dramatic mountainous morphology and wild seashores, then wins them over with its picturesque architecture and strong spiritual vibe. 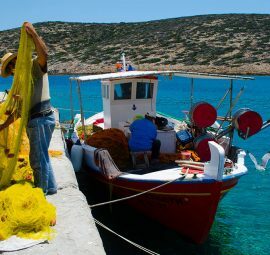 Amorgos is more about activities, spirituality and culture than beach-going and sight-seeing. 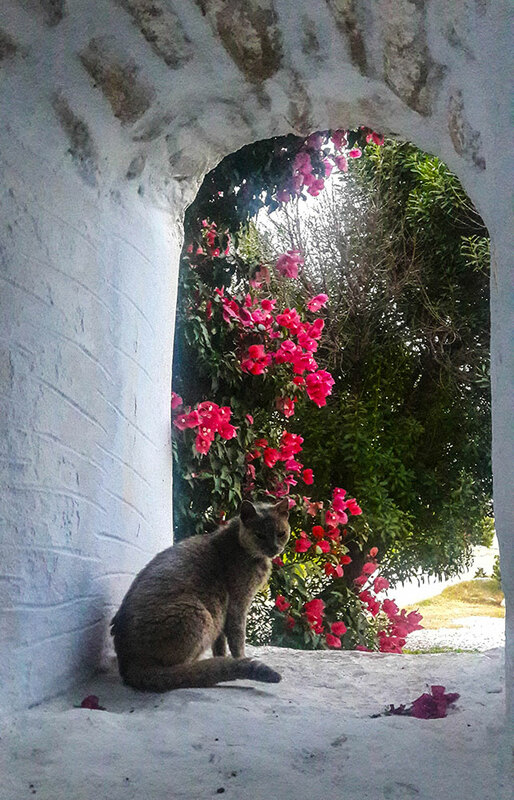 Besides the addictive beauty of its Chora and its famous deep blue waters, Amorgos is also a popular wellness and cultural destination offering everything from painting and poetry to yoga and reiki. There is also a great walking, diving and rock-climbing scene. In contrast to its daunting landscape, Amorgos is the island of harmony, tranquility, relaxation and fun. Amorgeans will welcome you to their way of life, offer you to taste their exquisite local dishes and invite you to join an enchanting mental journey. Venetian Castle: stands elegantly in the higher point of Chora. It was built back it the 13th century in order to protect the village from invasions. It is mainly a massive rock with fortification walls. 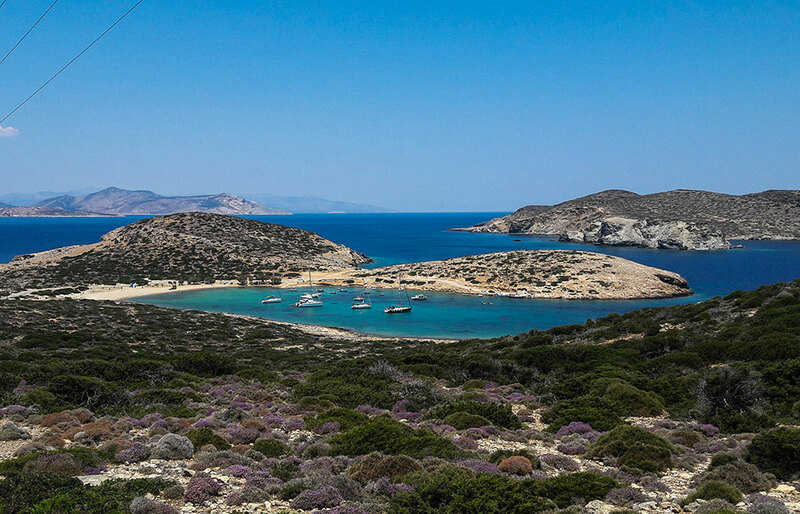 Its strategic location offers breathtaking 360 degree views of the entire village and the Aegean Sea. The best time to visit without a doubt is sunset! Keep in mind that it is a bit tricky to climb its narrow and steep stairs, while you can ask to obtain a key to enter the castle from one of the local shop treasurers at the main square. 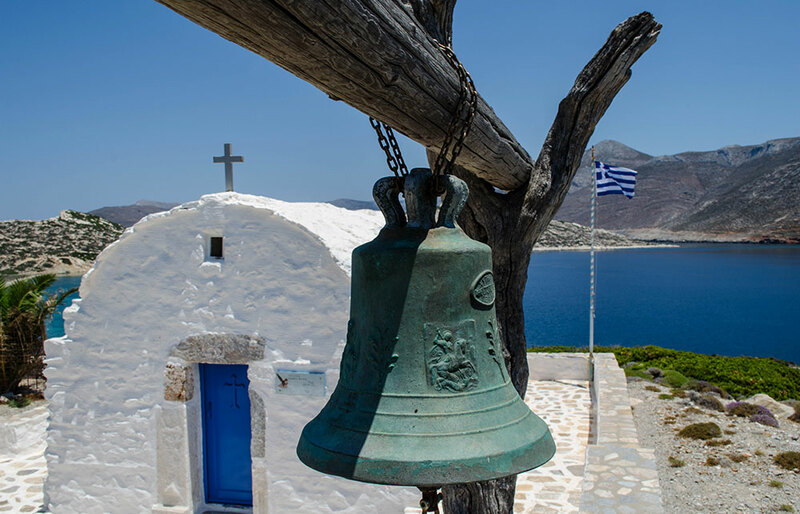 The Monastery of Panagia Hozoviotissa: is the pride of Amorgos, and one of the most famous Monasteries in Greece. It was constructed in 1017 making it the second oldest Monastery in Greece. It was built into the face of a steep cliff, literally hanging over the sea. It was constructed there due to the icon of Virgin Mary that was found on the spot. Her icon was believed to have arrived on a boat from Hozovo of Palestine during the persecution of Christians in the 9th century. Its stunning location provides breathtaking views of the Aegean Sea and a sense of awe.The divinity of the place is evident from the moment you lay your eyes on the monastery. Climbing to the top might be challenging. To enter the monastery you will have to ascent 300 stairs. At the top, monks welcome tired visitors with traditional treats (psimeni raki and loukoumia) and direct them to a cool and quiet room where they can rest for a second and catch their breath. Keep in mind that the monastery has a cover up dress code in order to enter, so long skirts are offered at the entrance to put over your clothes if you do not come prepared. Ancient city of Minoa: is one of the most important ancient settlements on Amorgos. It was named after King Minoan of Crete, as excavations reveal that was originally his summer residence. The city was populated for many centuries and a lot of important findings prove its great history. The ruins of the ancient city are situated right above Katapola village. Agios Georgios Valsamitis church: is a small church located on the way from Chora to Kamari. The church was built in the 16h century on the remnants of an ancient temple dedicated to the God Apollo. Today is a dependency of Hozoviotissa Monastery. The church has a very interesting history. It is built right next to a natural spring that is thought to have miraculous healing properties since pre-Christian times. The faith on the holy water is very strong among Amorgeans. Priest claim they can read a person’s destiny for a glass of water. 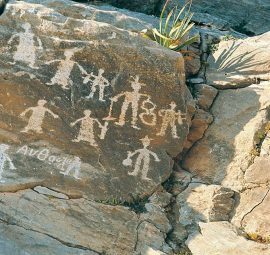 According to locals, for thousands of years the predictions have come true! The Archeological Museum of Amorgos (Gavras Hall): is located in Chora. The exhibition is housed in an old Venetian mansion known as Sala tou Gavra (Hall of Gavras). The museum contains interesting prehistoric finds, including objects from the Minoan period, as well as objects from the Hellenistic, Roman and Early Christian periods. Nikouria Island: is nowadays an uninhabited islet, right across Agios Pavlos beach. It was known for its currency construction in ancient times and later was used as a shelter for lepers. Today Nikouria has 3 unspoiled beaches that you can visit by boat. The Shipwreck: is located in the gulf of Livero. The boat “Olympia”, was crushed here back in 1979, without any human loss. Scenes of “Olympia” wreck were used in Luc Besson movie “The Big Blue” and made the island famous worldwide. 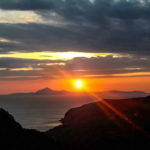 The island is known for its wild and dramatic mountains with breathtaking views, climbing routes, rare flora &herbs, free wild life, bright night stars, rich sea bed, natural reefs, deep blue waters, long history and strong culture. 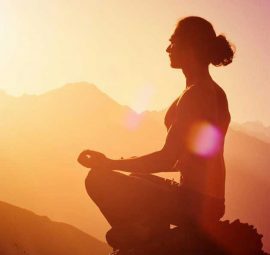 The island offers an extensive list of interesting activities, from hiking, rock climbing, diving, fishing, snorkeling, night sky watching, grape harvesting, olive picking, to yoga, dancing, cinema and exhibitions. Visitors with a deep love of nature and culture will greatly enjoy the many exquisite activities the island has to offer. 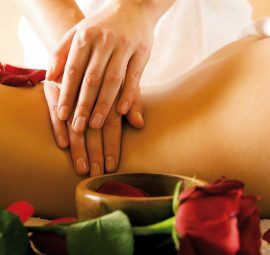 Engaging in such activities is a must in this highly energetic place! 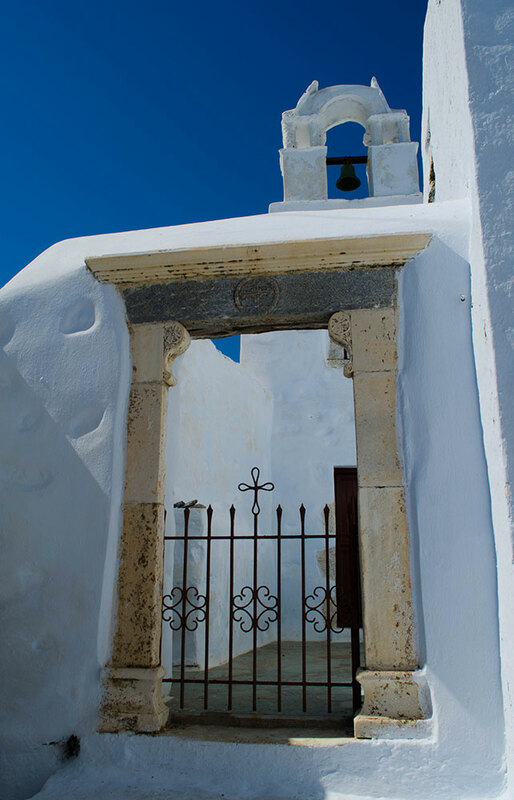 Chora is the capital of the Amorgos and one of the most beautiful villages in the Cyclades. It is a perfect Cycladic village that at every turn offers something pleasing to the eye; old traditional mansions, narrow cobbled alleys, whitewashed houses, charming churches and picturesque squares. It is also filled with nice, atmospheric bars, cafes, restaurants and small shops. On the top of Chora there is a 13th century Venetian Castle worth visiting, which offers wonderful sunset views. Another great view spot is just behind Chora, on the windmills’ hill, where you can admire a breathtaking view of the Aegean Sea. In Chora you will also find the Archeological Museum, known as “Hall of Gavra”, which contains interesting exhibits excavated on the island dating more than 4000 years ago. 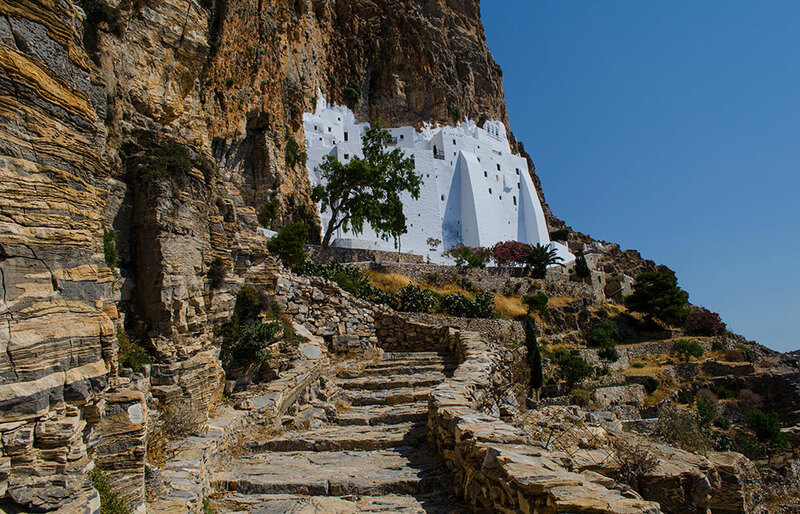 Close to Chora is also the pride of Amorgos, the famous Monastery of Hozoviotissa, which is literally hanging on the cliff side 300 meters above the sea. There is a short but astonishing route(1,5km, 30min walk) starting from Chora to the Monastery with an amazing view to the Aegean Sea. Katapola is the main port of Amorgos, located 6 km west of Chora. The region is divided into three different settlements, Katapola, Rahini and Xilokeratidi. On the right, there is Katapola village, where the central port is found. Along its waterfront there are many cafés, restaurants and shops. Right next to the port, there is a small sandy beach with crystal calm waters. In the center of the port area there is the small village of Rahini, where you will find the church of Agios Georgios. 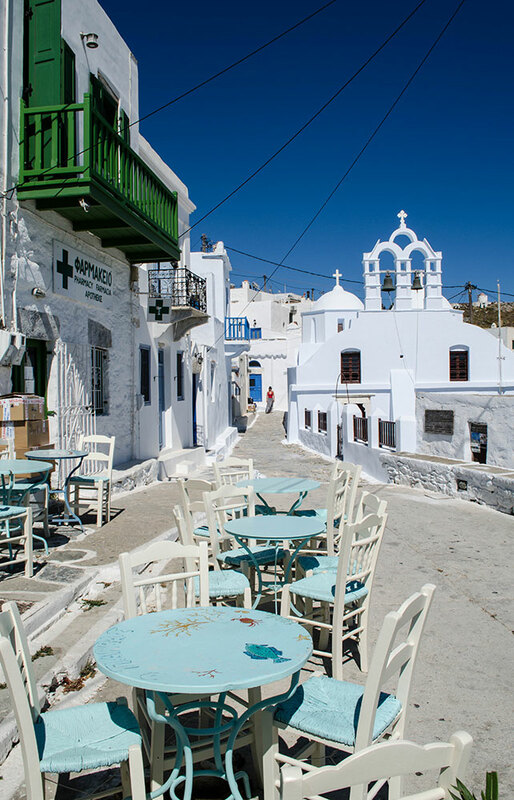 Xilokeratidi is picturesque village, opposite to the port, with narrow paved alleys and whitewashed houses. On the hill over Katapola, lie the remains of an ancient Cretan city of Minoa and a Mycenaean cemetery. The view from the three villages surrounding the bay and the vast plain right behind them, compose a beautiful scenery that charms its visitors right from the very beginning. Aegiali port is situated on the northern side of the island, 15km from Chora, and the second largest port in the island after Katapola. This is a vibrant village known as the nightlife spot, filled with tavernas, cafes, bars, shops and all sort of accommodations. 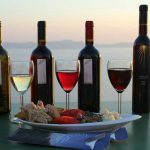 Some of the best tavernas and cafes are found here. The village of Aegiali is concentrated around its long sandy bay and is the starting point for several hiking trails in the surrounding areas. Aegiali is surrounded by 3 enchanting mountain villages, built in the slopes of the mount Kirkellos: Tholaria to the left, Lagkada in the center and Potamos to the right. These picturesque whitewashed villages charm visitors with their authenticity and tradition and are definitely worth a stroll. 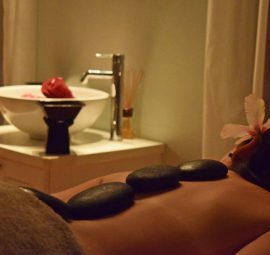 The villages are also known for their argotourism activities and therapeutic facilities. 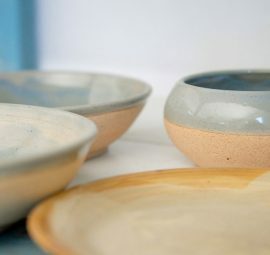 Aegiali: is a long sandy beach with blue waters and tamarisk trees. The beach is ideal for families with children and those looking for relaxation. It is partially organized and around the beach there are all sorts of amenities, including restaurants, bars, cafes, accommodation, shops etc. You can reach Aegiali by car. 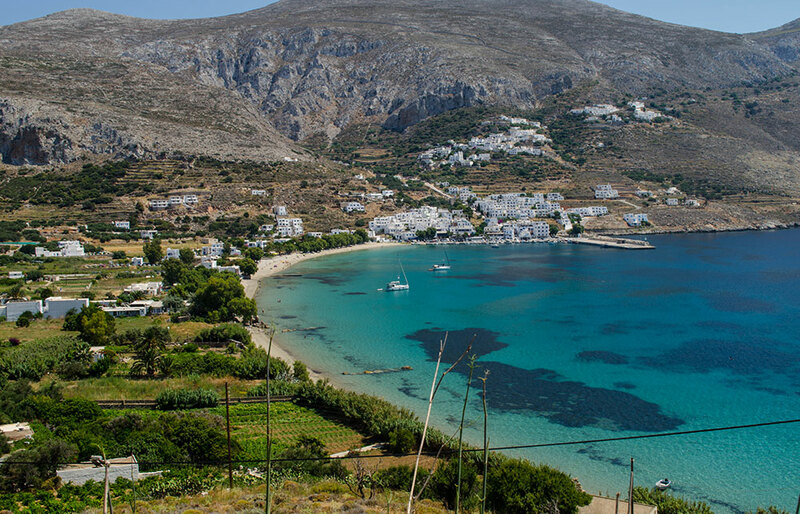 Agia Anna: is one of the most famous beaches in Amorgos. Scenes of the popular movie “The Big Blue” were shot here. 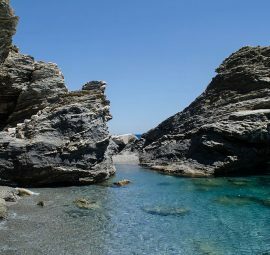 It is a pebbly and rocky beach under the monastery of Hozoviotissa close to Chora. The beach is located at the bottom of a very steep hill, offering a small oasis in the middle of an exceptionally wild natural scenery. Its deep blue green waters are ideal for snorkeling and diving. Agia Anna is not organized; however there is a small beach bar nearby. The beach can be reached by car or bus. Agios Pavlos: is a white pebble beach with blue waters located on the north part of the island close to Aegiali. 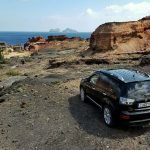 It has a taverna and beach bar, while you can reach it by car. Right across it is Nikouria, a small uninhabited islet, which can be visited only by boat. 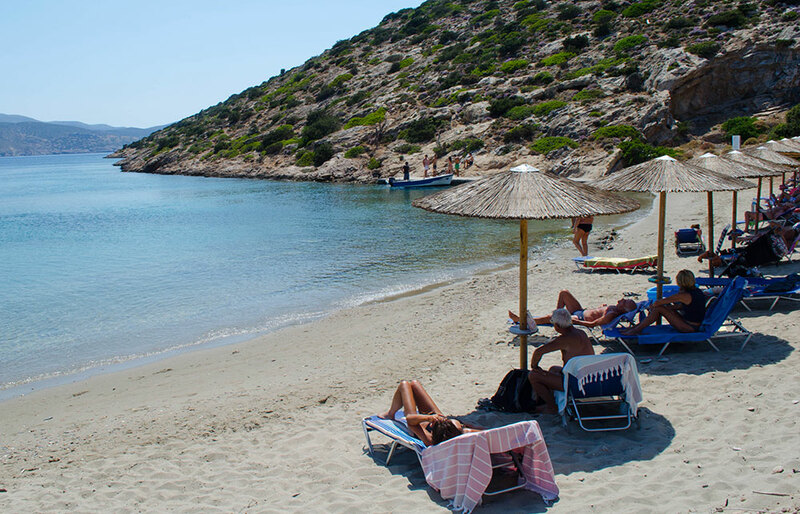 Kalotaritissa: is a sandy beach located on the southern part of Amorgos. The beach is a popular spot for fishermen, who anchor their boats there. It has crystal clear waters, a few umbrellas and sand beds and a small snack bar. Kalotaritissa can be reached by car or bus and then on foot. Maltezi: is a popular beach close to Katapola. This sandy beach with clear shallow waters is ideal for those looking for tranquility and relaxation. It is organized and also has a beach bar on site. You can reach Maltezi on foot form Katapola (30 min walk) and by frequent sea taxi ride from the port. 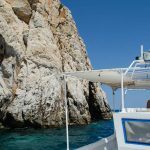 Mouros: is a snorkeling paradise and one of the most beautiful beaches in Amorgos. It is situated close to Vroutsi. This amazing grey pebble beach offers crystal blue-green waters, sea caves, small private swimming spots and cave pools to discover. The beach is unorganized, but there is a taverna right above the beach next to the parking lot. It can be reached by car and bus, then a number of steps. 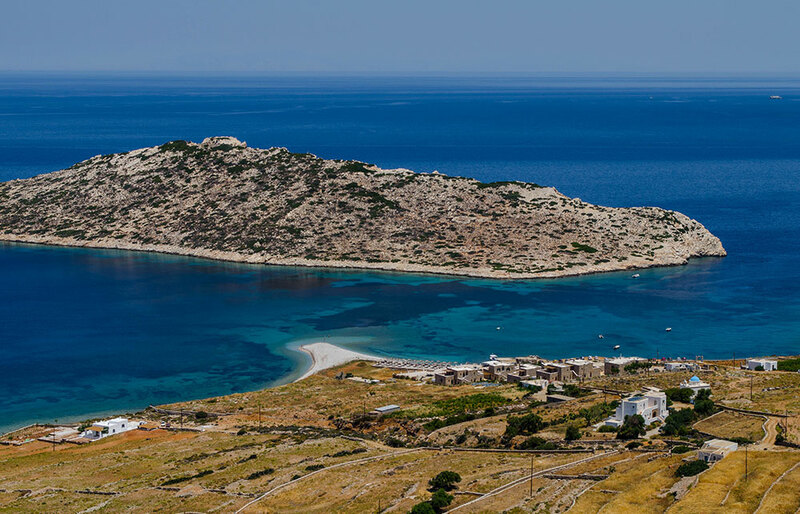 According to Mythology, the Minoans founded the city of Minoa in Amorgos. It is believed that King Minoa ruled the island, along with Crete, giving his name to an ancient city on the island. Another popular myth supports that Minoa was a colony of Samos, Arkesini was a colony of Naxos and Aegialis was a colony of Milecians. Together these three cities formed the Commonwealth of Tripolis. 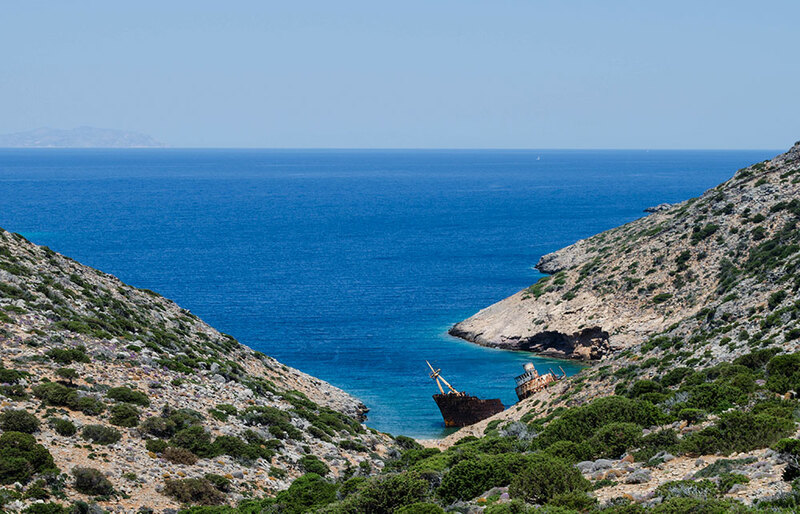 Ancient Years: Amorgos has been inhabited since prehistoric times. 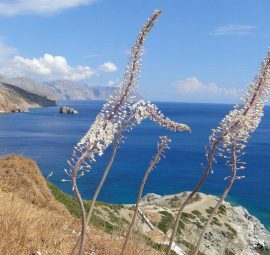 Findings reveal that Amorgos was one of the most important centers of Cycladic civilization with developed trade, arts and culture. Due to its geographic proximity close to the Ionian cities, Amorgos played an important role to the immigration of Ionians in the Cyclades. Roman and Venetian Years: During Roman years Amorgos was a place of exile. Afterwards, during the Venetian rule it became a permanent pirate shelter. Ottoman Years: The island was occupied by the Turks and managed to form a small self –governed democracy referred as Amorgos Community, which was taxed by the Sultan. Greek State: Amorgos became part of the Greek state in 1832. Agios Theologos: is held twice a year, on May 8th and September 26th, at Kroukelos. Agioi Anargiri: is celebrated on July 1st in Tholaria. Agia Paraskevi: is the biggest festival in Cyclades, with visitors reaching up to 4000. The feast is held in Arkesini on July 25th, while the preparations begin 10 days before the actual celebration. The transfiguration of Christ: is one of the biggest feasts in Amorgos and is celebrated in Chora on August 6th. Festival of Panagia: is celebrated on August 15th in Langada. Festival of Stavros: is held at Stavros on September13th - 14th. Anniversary of the Monastery of Hozoviotissa: is celebrated on November 21st. Hozoviotissa is the protector of Amorgos and a big feast is being held in her honor. Believers from all over Greece are gathered in Amorgos to celebrate. World Music & Song Day: is a concert held on June 21st in Chora by the children choir of Amorgos. 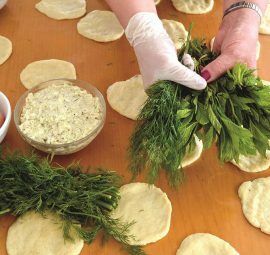 Psimeni Raki Festival: is held on July 26th in Katapola. 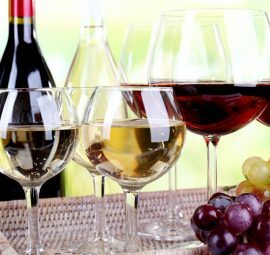 Visitors have the opportunity to see how this special local beverage is made and also enjoy lots of psimeni raki, local delicacies and traditional dancing. Constellation of Amorgos: is a summer festival which offers open-air concerts, dance and theatrical events in venues all over Amorgos.